JACKETS & COATS Technical waterproof jackets, perfect for all seasons. 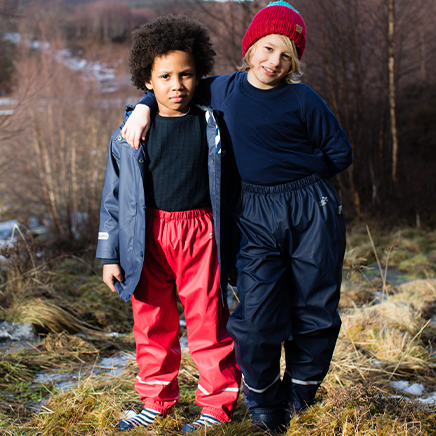 TROUSERS Waterproof trousers perfect for outdoor adventures. 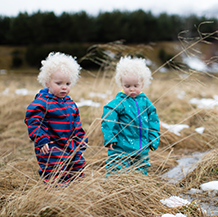 ALL-IN-ONESSnow & rain suits for babies and children age 0-12. WELLIESFor dry, warm & cosy toes come rain, mud or puddles. About UsRead our story here. PressDiscover our great product features. 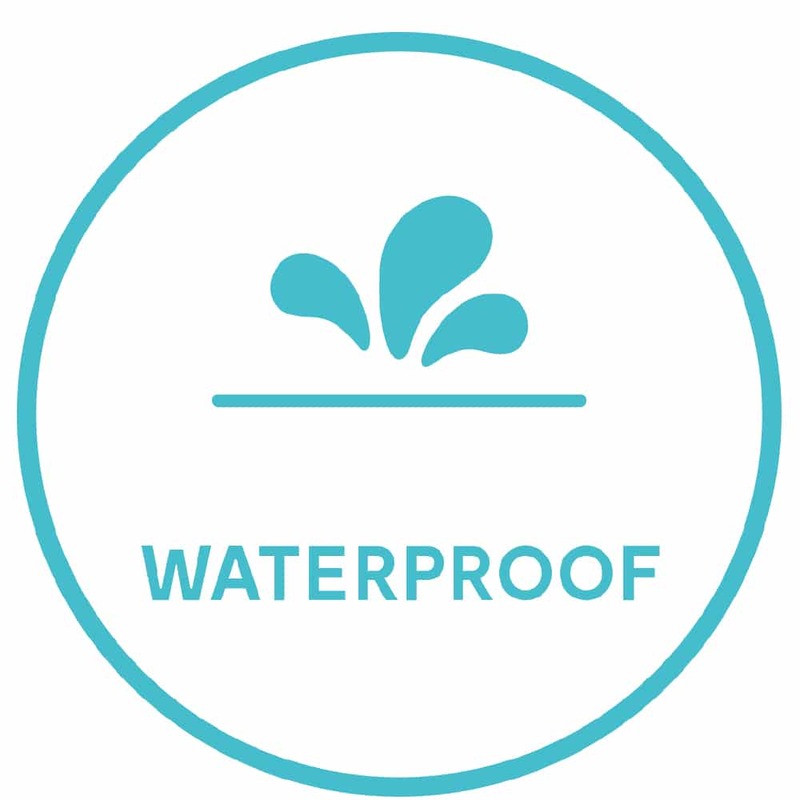 What makes our products waterproofRainwear that works. 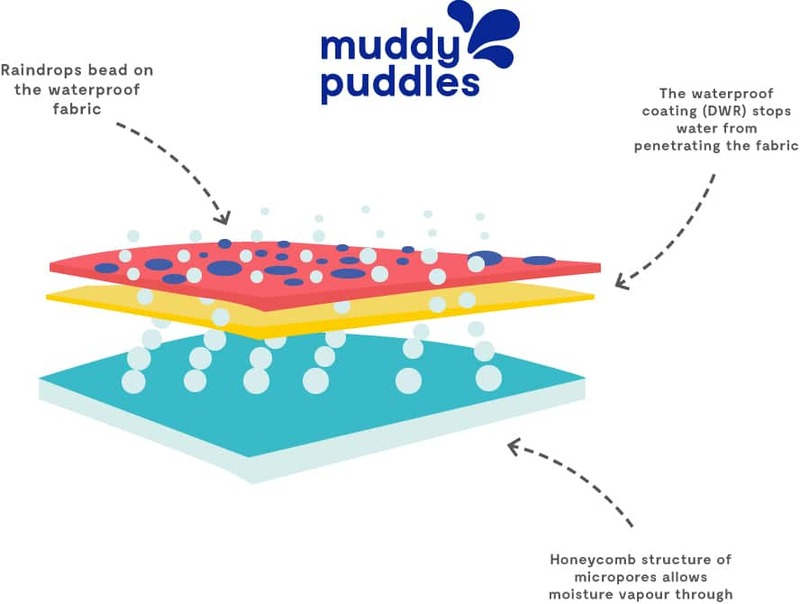 At Muddy Puddles, every product we make is tested to be super waterproof and designed to withstand the rough and tumble of active, outdoor play, whatever the weather. 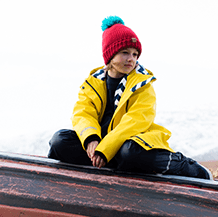 Read on for our handy guide on what makes our brilliant children's outerwear waterproof. 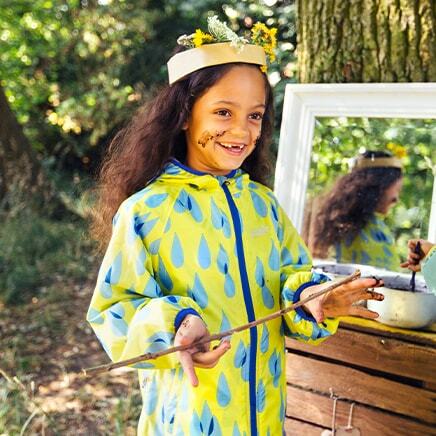 We specialise in waterproof outerwear for young, bold explorers who love jumping in puddles and dance in the rain. With over 20 years’ experience equipping the boldest, muddiest children for the great outdoors every detail has been considered. Our products are made from cutting edge fabrics to ensure that they are entirely fit for purpose, waterproof, breathable, and durable. They have taped seams for additional waterproof protection and yank proof zips. Every product is super waterproof. All outerwear has taped seams, waterproof zip protection and has passed a hydrostatic pressure test to a rating of a minimum of 5000mm and up to 10000mm. Ultimate protection from cutting winds is integrated in to all our winter jackets which makes them perfect for outdoor adventures and skiing. 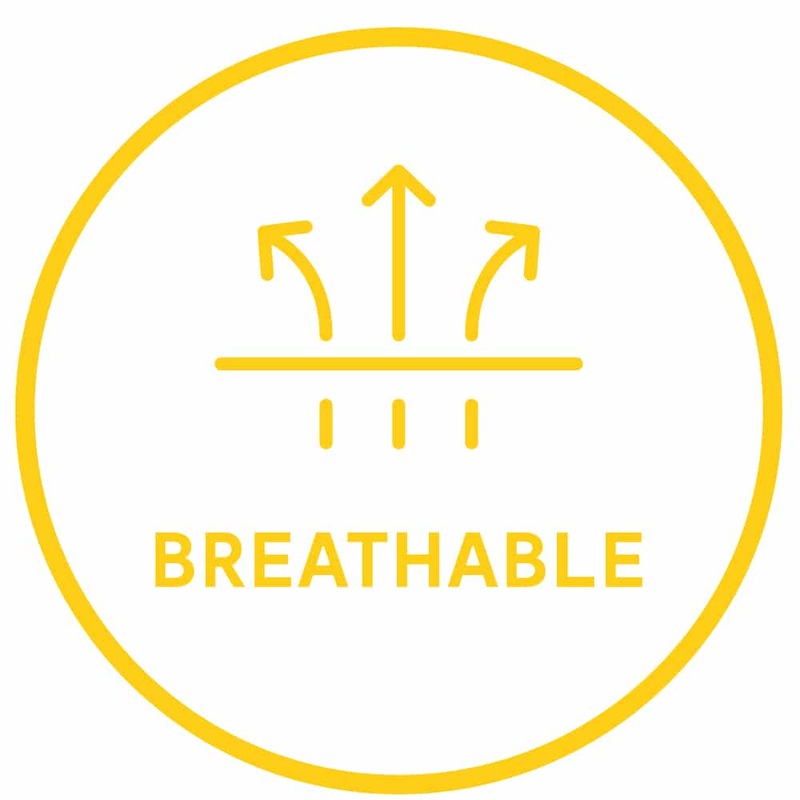 Our products are breathable which prevents hot and sticky children when racing around outdoors. It has a DWR (Durable Water Repellant) coating that creates a honeycomb structure of the micropores allowing moisture vapour through. 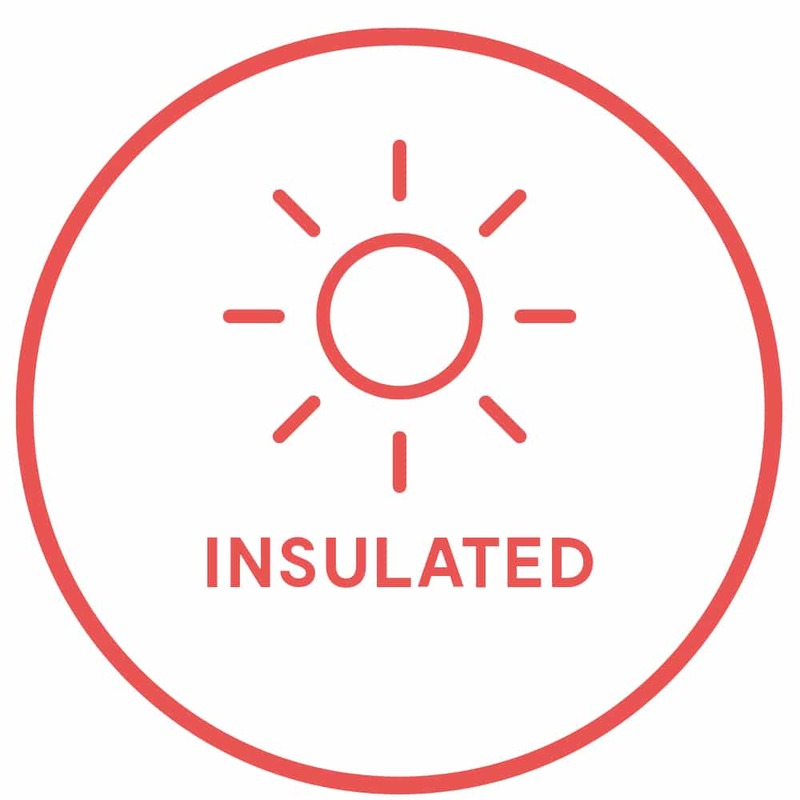 There are different weights of insulation or soft fleece linings in our outerwear depending on the weather. We offer outerwear perfect for breezy autumn and spring (with 40gm fleece) and polar extremes (240gm insulation plus fleece linings) for freezing winter days. 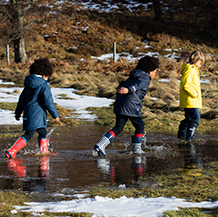 One thing is sure - your children will always be protected when playing outside whatever the weather..
WHAT MAKES OUR OUTERWEAR WATERPROOF? So what is waterproof-ness all about? 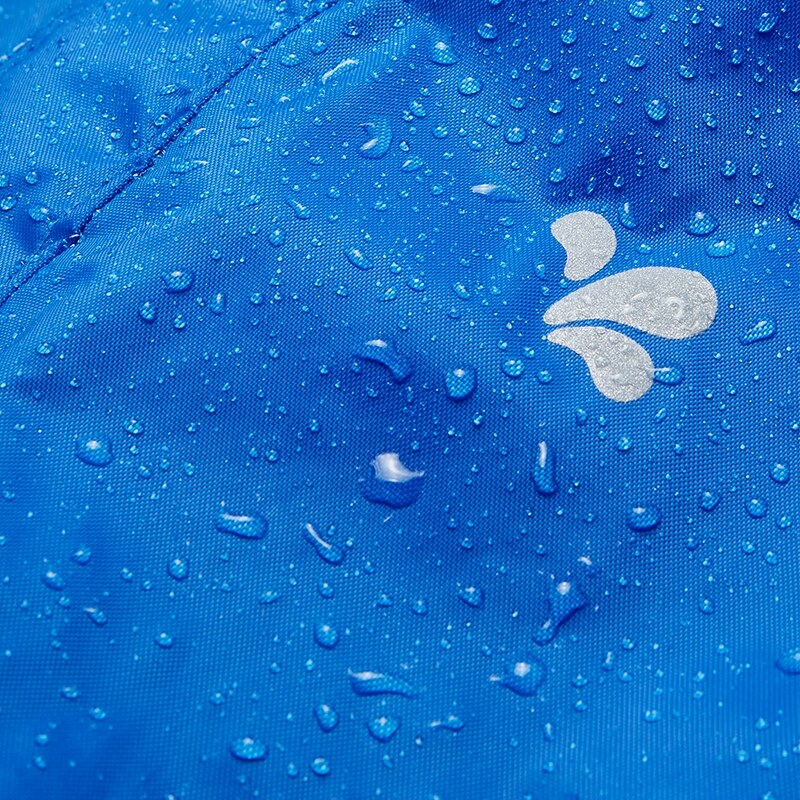 What makes a jacket waterproof and suitable for playing outdoors come rain or shine? To make a garment fully waterproof, any (even the tiniest) holes need to be sealed up. Taped seams are used to make a waterproof jacket’s seams more watertight. We apply hot-melt tape to the inside seams of the fabric to eliminate holes and seal the fabric against water permeation. 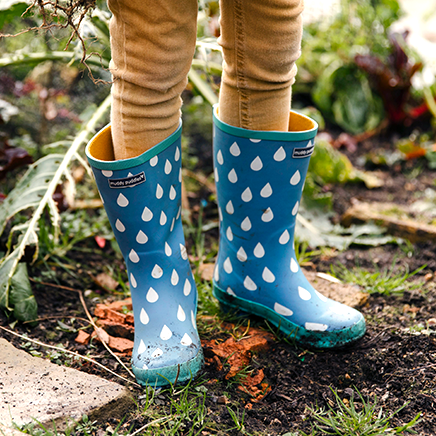 This way Muddy Puddles kit is fully waterproof and withstands even the rainiest, wettest days. As the fabric itself is not waterproof, we need to…well, make it waterproof! We ensure the waterproofing of our products with the DWR (Durable Water Repellent) coating which penetrates the fabric so that it forms a honeycomb structure with billions of micropores. 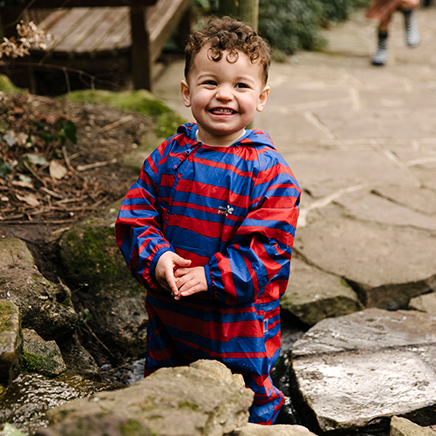 The pores are too small for water droplets to get in (which makes the garment waterproof) but large enough to allow it to be breathable and comfortable for young explorers. 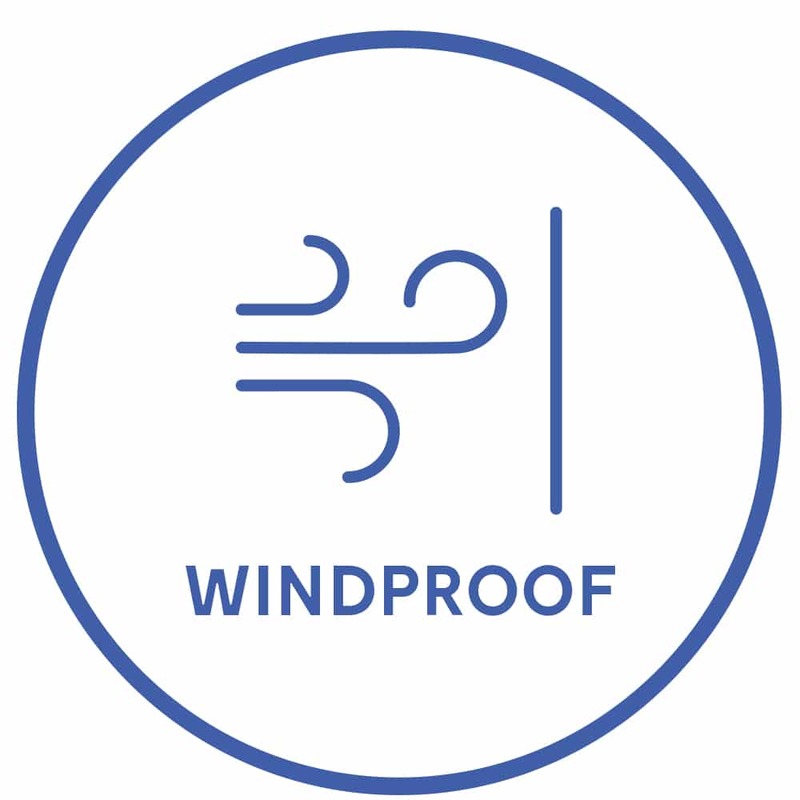 Our garment is also windproof which is ensured by the taped seams that prevents any biting winds getting through the fabric. Other important technical features within the design include YKK yank proof zips that can handle the rough and tumble of young adventurer’s active play. Waterproof and water resistant outerwear doesn’t offer the same level of waterproof protection. Water resistant garment offers a lower level of rain protection. Water resistant jackets or trousers are usually more affordable than the waterproof ones. On the flip side, they’re much less protective in case of heavy downpours. No taped seams mean if your little adventurer stays outside for too long, the fabric will get wet. 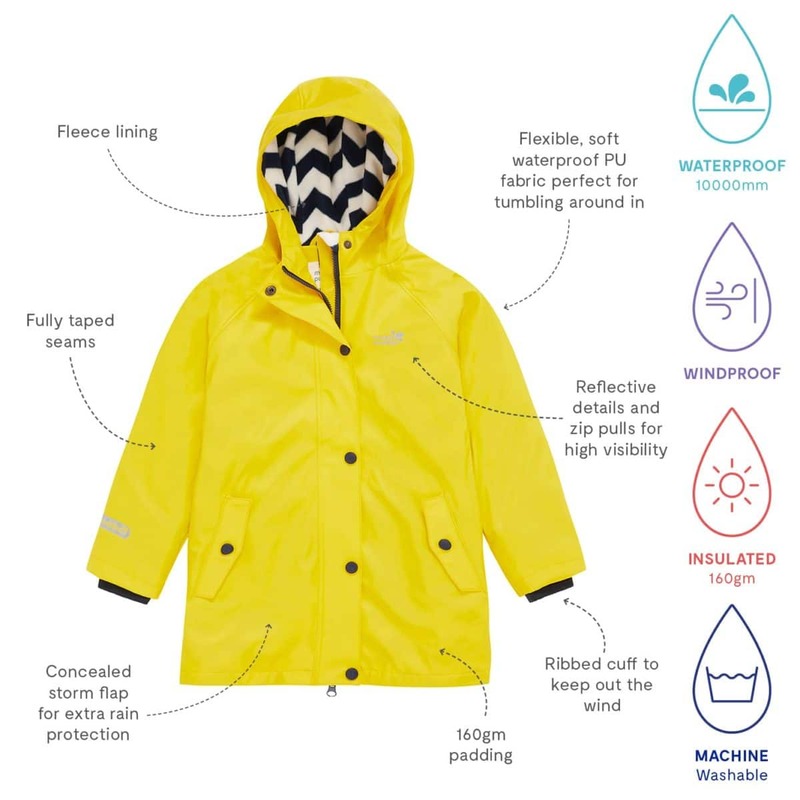 Waterproof outerwear has taped seams and waterproof coating on the outer fabric which will keep children dry even in the heaviest rain. Our products are tested with a hydrostatic head to ensure they withstand 3000mm of water (anything that can withstand 1000mm + is classed as waterproof). Hydrostatic head is the measure of how waterproof your outerwear is and how much water the fabric can hold before getting wet. All our products are waterproof, never water resistant which means they are perfect for playing outside when it rains without the risk of getting wet. There are different levels of waterproof-ness, breathability and insulation. This product is waterproof. Designed to withstand moderate to heavy rainfall. It has taped seams, waterproof zip protection and has passed a hydrostatic pressure test to a rating of 5000mm. Bring on the rain, the mud and the puddles! This product is ultra waterproof. Designed to withstand heavy rainfall. It has welded seams, waterproof zip protection and has passed a hydrostatic pressure test to a rating of 10000mm. Ideal for some serious puddle-jumping! This product is 3000gm2 breathable which prevents hot and sticky children when racing around outdoors. It has a DWR (Durable Water Repellent) coating that creates a honeycomb structure of micropores allowing moisture vapour through (but too small to let water droplets through – phew!) Get ready run, jump or race in the rain! This product is 5000gm2 breathable and will keep your young explorers dry and happy. Its a DWR (Durable Water Repellent) coating creates a honeycomb structure allowing moisture vapour through without letting any water in. Nothing ruins outdoor fun more than chilly children. This product has cosy polar fleece lining and 40gm insulation. This means it is lightweight but warm, perfect to keep out the cold in bracing winds and the cooler autumn temperatures. This product is even cosier thanks to its 160gm insulation. This means it is the ultimate warm protection, perfect for embracing ice, snow and extreme cold. Our clothes are machine washable and easy to clean. If you look after them properly, they will look great and last for years. We say No to disposable clothing culture and are all about high performance outerwear which can be handed down and serve as many young explorers as possible. • Remember not to use fabric softener as it reduces the effectiveness of the waterproof finish. • Leave the clothes to dry naturally and never dry them with direct heat. 1) Can you wash waterproof clothes? Of course! Our products are fuss-free and super easy to wash - they have been designed with mud-loving children in mind. Before washing, have a look at our care guide (point 5). Remember not to use fabric softener as it reduces the effectiveness of the waterproof finish and leave the clothes to dry naturally. 2) What is the 3-part layering system? The 3-part layering system is key to ensure your muddy pups full protection from blustery gales, rain and snow. In classic British conditions, you’ll need to deploy the 3 main layers. Start with a wicking base layer, on top of that you’ll need a mid-layer to insulate you. Finally, you need your breathable waterproof as an outer layer. 3) Do I need a different waterproof jacket for every season? 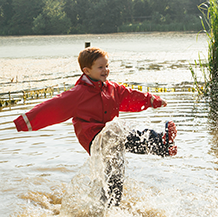 A waterproof jacket is a must-have for all young adventurers braving the great outdoors. As the British weather can be quite unpredictable, being rain-ready is crucial. We recommend warmer, fleece or Sherpa-lined jackets for colder months, ultra protective and great for skiing and freezing temperatures. Lighter, waterproof jackets are perfect for rainy British spring and early autumn. *Promotion code EASTER25 valid until Midnight, April 19th, 2019 on full-price items on a minimum spend of £40. New purchases only, previous purchases are not eligible. This offer is not valid in conjunction with any other offers. All orders are subject to acceptance. View our Terms and Conditions here.